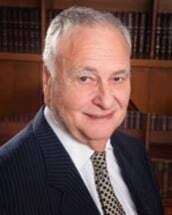 Robert J. Milavetz is a leading personal injury and family law attorney since 1963. He is founder of Milavetz, Gallop & Milavetz, P.A. He graduated from the University of Minnesota and William Mitchell College of Law. He has authored articles, instructed and lectured on legal topics at law schools, colleges and continuing legal education. Mr. Milavetz has been a frequent guest on numerous television and radio programs. Mr. Milavetz's clients have been featured in magazines and newspaper articles. He has successfully tried numerous cases nationwide and has won many significant appellate court decisions. He is a member of the Hennepin, Minnesota and American Bar Associations, and Minnesota Trial Lawyers' Association. Mr. Milavetz has been named as a Minnesota Super Lawyer by his peers. Mr. Milavetz has also been certified as a trial lawyer specialist. Mr. Milavetz is a plaintiff in the case of Milavetz, Gallop and Milavetz, P.A., et. al. v. United States of America which successfully declared portions of the Bankruptcy Reform Act (BAPCPA of 2005) unconstitutional, which has been accepted for review by the United States Supreme Court. Attorneys at Milavetz, Gallop & Milavetz, P.A., are rated* AV by the respected, nationwide Martindale-Hubbell Law Directory. The ratings are developed by obtaining confidential opinions from lawyer adversaries and judges before whom the lawyer has appeared. Ability rating categories are A, B, C, and no rating. An "A" rating is the "very high to preeminent" category, the highest rating possible. It signifies that the lawyer has reached the heights of professional excellence, recognized for the highest levels of skill and integrity. The "V" rating is the highest for adherence to ethical standards, reliability and diligence.